The Intercounty Highway system is the second statewide, county-based route numbering system used in Michigan. 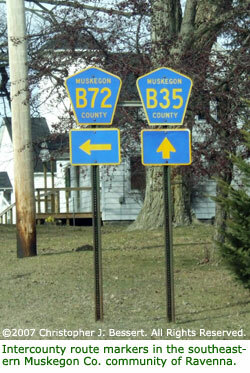 While several of Michigan's 83 counties utilize a locally-determined county road numbering system, the Intercounty Highway program was begun in 1970 in order to provide a consistent, statewide county numbering system for identifying primary county roads which retained their designations across county lines. While the system took off in earnest in the early-1970s, many of the County Road Commissions have seemed to have cooled to the idea—some have let their signage along the Intercounty Highway system to lapse, while many others only partially initiated the system or never did so at all. As the system is completely funded at the county level, no specific state funding is earmarked for the program. In recent years, signage, as well as maintenance, has become very poor in some areas, especially in Northern Michigan and the Upper Peninsula. As the Michigan State Highway Department worked feverishly at opening mile after mile of new freeway in the late-1950s and 1960s, the "old routes"—the old, parallel, two-lane highways replaced by the freeways—were being turned back to local control and were no longer signed state trunklines. In most cases, the counties and cities taking over maintenance of these routes gave them local road names which often changed every time they crossed into new jurisdictions. According to a story in the May 5, 1970 edition of The Holland Sentinel, it was Mrs. Gene Temple of Saugatuck Township who actually spear-headed the Intercounty Highway movement in the 1960s. Mrs. Temple, who owned a motor court on Blue Star Memorial Highway (formerly US-31) with her husband near Saugatuck, began her campaign in the early-1960s when the state trunkline designation was removed from the highway passing in front of her motel. First, Temple aired her concerns to the Saugatuck Village Council and the area chamber of commerce as well as writing letters to her legislators and the state highway commission. However, no progress was made and additional state trunkline designations were moved from their traditional routes onto newly completed freeways. The article states in August 1968, Temple once again decided to take her cause to those she thought could be of assistance. First, she contacted Fred Neils, Allegan County Engineer, who was responsive to her ideas. She then forwarded her concerns to Earl F. Rogers, Engineer-Director of the Michigan County Road Association. When Senator Gary Byker (R-Hudsonville) heard of Temple's quest, he jumped into the fray and scheduled numerous meetings on the topic. In addition to concerned citizens, such as Temple, these meetings coordinated by Byker also involved various officials from the municipal, county and state level. Through these meetings, what is today's Intercounty Highway system came into being. 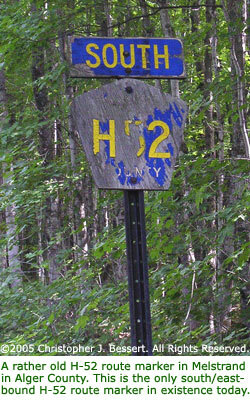 Fred Neils noted the route marker chosen was one recently adopted by the National Association of County Engineers as the 'standard' type of marker for just this purpose. At first, two Intercounty Highways were signed as part of an experimental plan to guage their success with the motoring public. 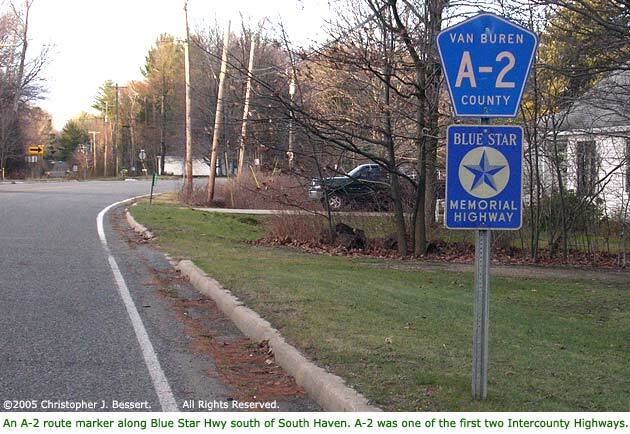 Temple's own Blue Star Memorial Hwy in Allegan Co was given the designation "A-2," while the former route of M-48 in the U.P. counties of Mackinac and Chippewa was designated "B-1." It seems the original plans were to give all Lower Peninsula routes a prefix of "A-," while the U.P. routes were to all begin with "B-." This system was soon changed when it became apparent there would not be enough designations available under the two-letter plan. The basic plan provides for dividing the state into eight zones, lettered from A to H. These zones are determined by major state and federal trunklines which form dividers. Within each zone, two-digit numbers will designate continuous routes, although each may cross several counties. In some cases, the route number may extend through one or more zones although the letter designation may change. The numbering system will employ even numbers for East-West roads and odd numbers for North-South routes. Lower numbers, such as 01 and 02, etc., will start at the East or South boundaries and progressively increase to the 90 and 91 levels toward the West and North within each zone. Thus, a traveler seeking to find A-28 could quicky determine that his destination is in the Southwestern Michigan area and that his route is an East-West road in the central part of that zone. The article went on to note Earl F. Rogers believed it would take "several years to make the plan completely effective" and that while the program was an optional one, each of Michigan's 83 road commissions had "agreed to the standardized plan." As anyone with a highway map of Michigan in hand can attest, the Intercounty Highway program saw pockets of extreme interest and areas complete indifference. In fact, of the eight lettered zones, the "E" zone—roughly the area bounded by I-96 on the south, US-27 (now US-127) on the west and US-10 on the north—has never seen any highways designated in the more than three decades since the program's inception. Also, only one county in each of the "D" and "G" zones have designated routes in their respective jurisdictions. Since responsibility for the maintenance and signing of the Intercounty Highways in Michigan has always rested with the various County Road Commissions, the system has seen a few pockets of expansion and several areas of neglect. While the system is (theoretically) statewide in nature, from its inception, MDOT has only acted in an overall coordinating capacity, for example ensuring the route designations are properly assigned and to ensure that the routes are depicted on the official state transportation map. In recent times, some counties have contemplated "decommissioning" some or all of their County-Designated (Intercounty) Highway system, resulting in their removal from the official state highway map as well. It is the opinion of this site's author that this would be an unfortunate turn of events and hopes a new "Mrs. Gene Temple" will someday step forward to revitalize and expand the current system for the benefit of Michigan residents and tourists alike. Attempting to follow some of the Intercounty Highway routes today is more of a challenge, especially in some of the poorer counties of Northern Michigan and the Upper Peninsula. While a few counties do an admirable job of signing and maintaining their Intercounty routes, others have been forced to spend their money on more pressing needs, such as roadway maintenance, snow plowing and the like. Motorists wishing to follow some of these routes in the poorly-signed areas are strongly advised to take along detailed county maps in the event signage is poor or missing completely. Because such route signage is often missing, even the best detailed local maps are not able to include the proper routing for the highways and leave navigation up to the motorist. To the best of his ability, the author of this website has attempted to catalogue each of the remaining Intercounty Highways, including several which no longer appear on the Official Michigan Highway Map! Unlike the state trunklines, information on these routes is harder to come by, therefore the listings for these routes is somewhat sparse in comparison to the state trunkline listings. Links to the pages containing the Intercounty Highway listings can be found at the top of this page or in the navigation menu on the left side of most pages in this website. Comments, suggestions and corrections on the Intercounty Highway system are always welcomed and encouraged at chris.bessert@gmail.com.